The first ILOA Galaxy Forum of 2019 was held at the Hawai’i Community College Pālamanui Campus in Kailua-Kona. Over 40 participants made this a lively and energetic community gathering, with presentations on Local, Lunar, Galaxy and Star matters. The well-attended Galaxy Forum Kamuela 2018 was a great collaboration between international Observatories operating on Hawai’i Island. Common themes throughout were Milky Way Galaxy Center research, public outreach / education and future science goals. Mayor Harry Kim also presented International Lunar Observatory Association with a Certificate of Appreciation at the event. Featuring Hawaii Mayor Harry Kim, who has generously accepted our invitation to make a presentation at Galaxy Forum Hawaii 2017 Kona about his vision for a “Maunakea World Park” referencing a quest for knowledge to make us a better people…Maunakea as a monument for the World from Cosmopolitan People of Hawaii. The protection and preservation of the historical and cultural specialness of this land, the most precious and beautiful place on earth. • A pursuit of knowledge to make us a better people, and better stewards of this land. • An international symbol of nations together for the pursuit of peace. Mauna Kea can be and should be a monument for the world for peace on earth. A home of the cosmopolitan culture (people that belong to the world)…a hope for the world. • The acknowledgment of the people of Hawaii and their contributions to the science of astronomy. Mauna Kea to be the living museum of the people of the First Nation of Hawaii. • I believe that Mauna Kea is an opportunity for Hawaii to be the center of discovery of mankind and of the universe. I believe that Mauna Kea can be and should be this. I do know Governor Ige is supportive of these visions and is pursuing how this can be done. It is a chalk drawing of the Milky Way. We used your map as inspiration. To give you a bit a context, the big circle panel is the back of a large clock, so my art students decided to paint it a with chalkboard paint, this way we can change the drawing. I think they all like it though, because we haven’t changed it around in months! 75 Galaxy Forums, with over 300 presentations to date. The theme of the 1st Galaxy Forum of 2016 is “Astronomy from the Moon”. Galaxy Forums are public events specifically geared towards high school teachers, educators, astronomers of all kinds, students and the general public. 65 Galaxy Forums, with a total of almost 300 presentations to date. This event is free and open to the public, but space is limited. Please RSVP to info@iloa.org or call 808-885-3474. ILOA is an interglobal enterprise incorporated in Hawaii as a 501(c)(3) non-profit to expand human knowledge of the Cosmos through observation from our Moon and to participate in internationally cooperative lunar base build-out, with Aloha – the spirit of Hawai`i. The ILOA co-sponsors with its Space Age Publishing Company affiliate an international series of Galaxy Forums to advance 21st Century Education. Galaxy Forums, designed to provide greater global awareness, capabilities and action in Galaxy science, exploration and enterprise, are held in Hawaii, Silicon Valley, Canada, China, India, Japan, Europe, Africa, Chile, Brazil, Southeast Asia, Kansas and New York. Current plans are for expansion to Antarctica and beyond. 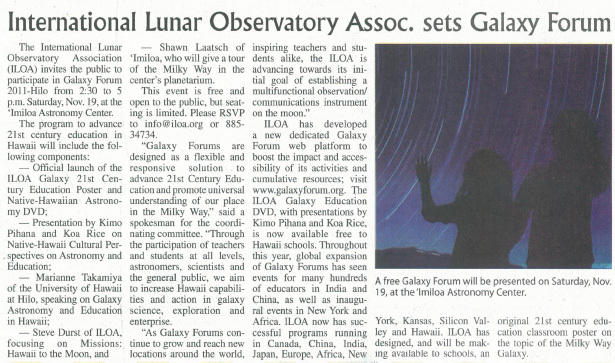 The International Lunar Observatory Association is currently putting together the program for its next Galaxy Forum event in Hawai`i and it is looking to identify a local teacher and / or student that is doing innovative work to advance Galaxy / Science education here on island. Please contact us to nominate yourself, a colleague or a student as a potential presenter at this event. Check out our website – GalaxyForum.org – for a listing of past presenters and details about our Galaxy Forum program. Please submit nominations or inquiries by email to info@iloa.org or call 808-885-3474. Galaxy Forum Hawaii – Waimea 2014 will be held at Anna Ranch in Kamuela on Wednesday, November 19 from 4:30-6:30pm. Along with the presentations by the local teacher and student, the Forum will include extensive updates on astronomy and astronautical research and educational activities underway on island, including a presentation on the 4 Moon Missions of the ILOA and its plan to build a global headquarters and education / research center in Waimea. Educators will receive a Certificate of Participation as well as 21st Century Galaxy education resources – such as the ILOA Galaxy Map 2014. They will also have the opportunity to arrange for an ILOA guest lecture / technology demonstration for their class. We will be sending you a formal invitation to the Galaxy Forum in the next month. Please don’t hesitate to contact us if you would like more information about the Galaxy Forum program or if you would like to share any ideas for this or future events. It is ILOA’s intention to make the Galaxy Forum a collaborative venue where local educators and scientists can share resources, ideas, concerns and goals to both showcase the innovative work already underway, and to provide additional support to our local educators and students. ILOA is launching its Galaxy Map 2013 – an innovative new resource for 21st Century Education – into local schools. This publication, over 1 year in development, is being made available to teachers and educators across Hawaii and around the world. 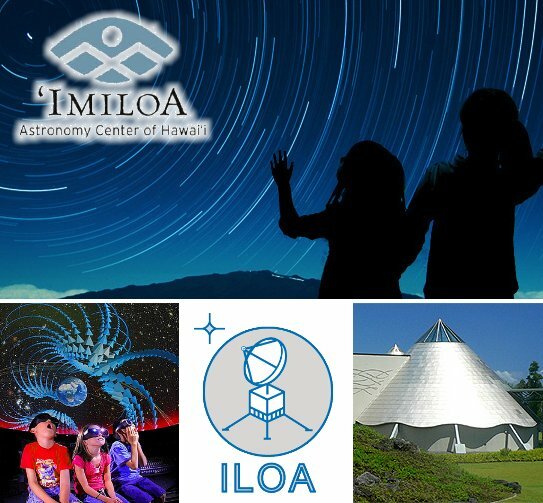 In addition to presentations from local educators about integrating space and science into the classrooms and curriculum, there will be a feature astronomy presentation and an update on the ILOA Global HQ development campaign. Galaxy Forum Hawaii 2013 — Galaxy 21st Century Education: Setting Sail for the Stars, a free public event hosted by the International Lunar Observatory Association and the Pacific International Space Center for Exploration Systems. These projects, particularly the Pacific Space Access initiative, have the potential to elevate the State of Hawaii’s position as a global leader in astronomy, technology and space science / education. As the ILOA looks upward to the stars and forward to the future we ask for your participation and guidance in helping to achieve the highest standards of excellence in Hawaii education, enterprise and exploration. Thanks for joining us for this Galaxy Forum on the ‘ILOA Moon Missions & Hawaii Culture and Exploration in the 21st Century’ at Canada-France-Hawaii Telescope Headquarters in Waimea. Exciting overview of the current progress of Hawaii-based International Lunar Observatory Association science and education missions to the Moon: ILO-1 to the Moon South Pole NET2014, ILO-X with GLXP Team Moon Express in 2014, ILOA-NAOC collaboration on the China Chang’e-3 in 2013, and leading the call for innovative independent Human ventures to the Moon in the near future. ILOA 2012 Galaxy Poster for 21st Century Education will be distributed free-of-charge to forum participants and associated schools. The poster, intended primarily for classroom use, features a full color Milky Way Galaxy schematic developed from the latest research as well as statistical overviews of Galaxy dimensions and composition. Interactive Panel Discussions will focus on how to best support teachers / schools / students in their efforts to achieve excellence in Hawaii 21st Century Education. Nancy Tashima, Space Curator at OSC will present on the educational resources, programs and materials available through OSC to Hawaii teachers, schools and the general public. Native-Hawaiians have for many centuries used Astronomy for navigation, story-telling, time-keeping, and education. Now, with the ideal location and environment atop Mauna Kea, Hawaii is home to a number of significant world-class astronomical observatories. The next step for Hawaii includes ambitious locally rooted interglobal efforts towards human and robotic space exploration. The ILOA is working on 3 missions to the Moon. The primary ILO-1 Mission, planned for as early as 2014, will establish a full-scale multifunctional observation / communication instrument on the surface of the lunar south pole and act as a permanent toe-hold for human development. The ILO-X Mission, is a precursor proof-of-concept mission that is currently in Flight Certification Design phase and may fly aboard the Moon Express bid to win the Google Lunar X Prize. Also the State of Hawaii program PISCES is working towards an International Lunar Research Park (ILRP), and aims to provide a state-of-the-art lunar analog testing site here on Hawaii for the next generation of exploration technologies. The newspaper covered the Galaxy Forum story on 19 January. 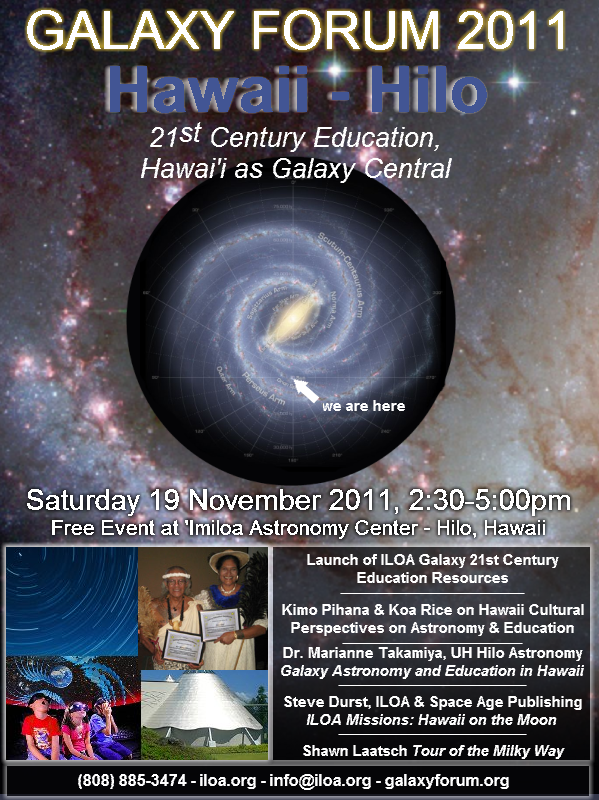 ILOA Galaxy Forum Hawaii programs continue with this event in Hilo on the Big Island, themed Hawaii as Galaxy Central. Later in the evening, after the conclusion of Galaxy Forum, Imiloa hosts their monthly astronomy talk Mauna Kea Skies, starting at 7:00pm. Click on the image below for a full-size version of our flier for this event. The Hawaii newspaper covered the build-up to our event in the Community News section on November 2nd. A DVD of the presentation will be available soon. Special ‘Galaxy Star Awards’ were given to Jon Lomberg of Galaxy Garden and Una Burns of West Hawaii Exploration Academy. Guests included Hawaii Island Galaxy Education pioneers and special invited guests. Download the Galaxy Forum Oahu flyer here. Mahalo to the O‘ahu teachers who particiated: Debra Gochros (‘Ewa Makai Middle School), Lina Fukuda (Adjunct Instructor, Leeward CC) and Lillian Yanagawa (Kalani High School). Click here to view the announcement or download the PDF flyer. The final of three 2010 Hawaii Island Galaxy Forum events was substantial in content with robust presentations from East Hawaii education, astronomy and Hawaiian culture specialists. In attendance were a few local teachers and educators as well as interested member of the general public. Local videographer Brad White taped the event and will be producing another DVD of Dr. Usuda’s excellent Galaxy Education talk for distribution to teachers to add to their science unit. Click here to see “Galaxy Forum Hawaii 2010 — Waimea” announcement. Click to read “Stellar academics: Forum stresses importance of astronomy education” West Hawaii Today, 31 January by Chelsea Jensen. Dr. Kumiko Usuda, Education Outreach Scientist of Subaru Telescope, gave an excellent and spirited presentation on How to Teach Galaxy Education to Students (11 MB), from preschool thru college. A DVD of Galaxy Forum Kona was filmed and produced by Hawai‘i Island Video. ILOA is distributing these DVDs to teachers around the Island for their classrooms. Click here to see “Galaxy Forum Hawaii 2010 — Kona” announcement. The focus of this meeting was to engage Hawaii Island’s teachers, education advocates and astronomers to plan and implement 21st Century Galaxy Education and awareness in Hawaii’s local schools and classrooms–elementary and secondary, public and private. Present were Helene Hale, James Kimo Pihana, teachers from Hilo, Kona, and Waimea, Kumiko Usuada of Subaru telescope and ILOA Executive Directors. How can “Getting to Know Our Place in the Universe” inspire, engage and influence the minds of keiki (children) in our classrooms? How can we integrate Native Hawaiian culture into 21st Century Galaxy Education? How can Galaxy / Astronomy Science and Galaxy Education materials be integrated into the K-12 standards-based education system? How can Hawai’i Island educators utilize the world-class resources of science and astronomy on this island? The Galaxy Forum Hawaii – Hilo attracted about 30 people to the Classroom Conference Room at the ‘Imiloa Astronomy Center at “Astronomy Row” in Hilo, Hawaii Island. Also in attendance were supportive members of the general public. Special thanks to Helene Hale for her time and particiaption at this pioneer Hawaii Island event. Click here to view the Galaxy Forum Hawaii — Hilo webpage and download the flyer. The Galaxy Forum Hawaii – Waimea attracted about 30 people to Parker School. Special thanks to David Corrigan of Big Island Video News for video coverage of the event. 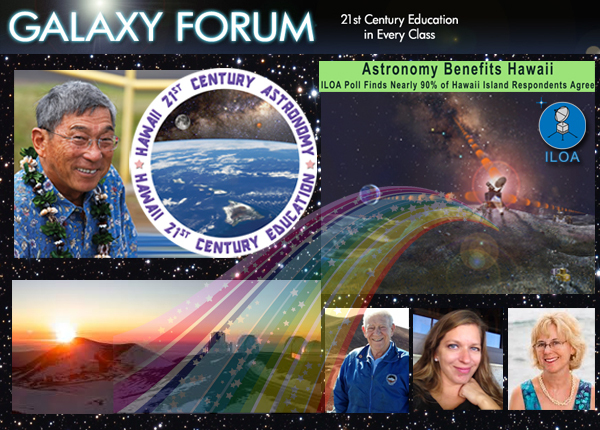 Click here to view the Galaxy Forum Hawaii — Waimea webpage and download the flyer. The Galaxy Forum Hawaii – Kona, the first of its kind in Hawaii, was an exciting and successful event. Onizuka Space Center Curator Nancy Tashima opened the doors to the community for the event, which attracted about 30 people and filled the theater to capacity. A special thank you goes to teacher Una Burns of West Hawaii Explorations Academy for her participation.